It is nice to be on holiday with the comfort you have at home. The comfortable and clean Casa Monteverde is the right choice if you wish to spend your holidays in a peaceful atmosphere in the country, away from the traffic and noise of most touristic sites. Wonderful view on all the surrounding valleys. 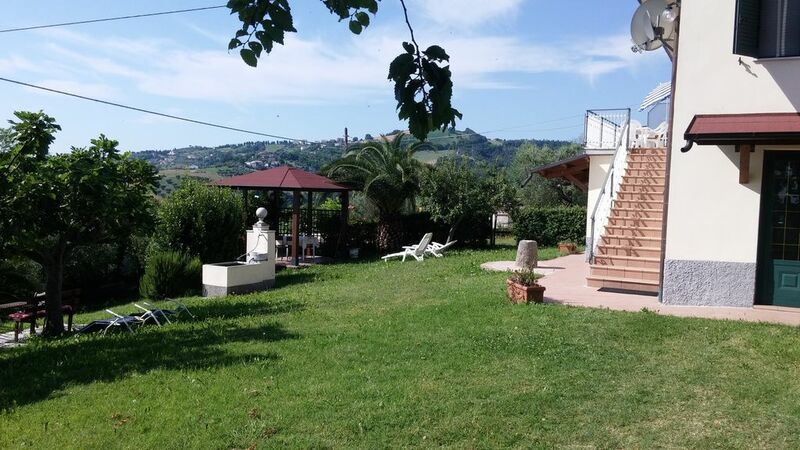 Casa Monteverde is the ideal place to recover from stress, surrounded by a large grassy area with old olive trees the apartment has its own terrace with view over the mountains and the valley to the sea. It is perfectly located if you wish to go for a walk on the mountains or spend your time on the beach. Tourist information are available at the house and the owners will be pleased to help you and provide any information you need during your stay. A book with more than 130 photos fully devoted to the Province of Teramo and its most attractive and atmospheric locations. The volume “Ager Praetutianus”, latest work of the photographer Maurizio Anselmi from Teramo, reflects the extraordinary environmental, historic and cultural heritage of the Teramo province. Casa Monteverde is pleased to offer this volume for free to all guests staying 2 weeks or more as a souvenir of the local heritage. "Fantastic. Exactly as described. We only booked the villa for a week and ended up staying nearly three. Beautiful surroundings, wonderful views, clean, spacious, everything you need for a perfect holiday including a fridge full of food!! Guilio thought of everything to make our stay incredibly pleasurable. First Rate." "We had a fantastic holiday at Casa Monteverde. It is in a rural, peaceful situation. Giulio is very modest about this, but his English is very good and he was extremely helpful with information and assistance before (by email) and during the holiday. He had thoughtfully provided a Holiday Guide in English, with a variety of useful information about places to visit, tours of the mountains, restaurants, local services and shopping. The accommodation was spotless, well equipped and very comfortable. The loggia which has wonderful views the garden, valley, mountains and to the sea was a perfect place to relax. Giulio met use in Castlenuovo. We arrived (via Pescara Airport - cheap flights Stansead Ryanair) to find a cupboard of food, pasta, homemade sauce and a fridge with fresh vegetables, cheese, ham and other goodies. Giulio's extended family who live nearby were friendly. When we encountered a problem Giulio responded immediately and when I lost my mobile phone, unbeknown to me, he had sorted the problem out and collected the phone for me having liaised with my son by email in England. In short, the perfect host, a house in the perfect place and the result was a wonderful and unforgettable holiday. I am sure I will be back." "An excellent place for us. We could get to the mountains and the sea. The owner was very helpful when we needed him. We hope to be back one day but there are many other parts of Italy that attract us!" "Une sublime maison nichée dans une petite montagne, cachée parmis les oliviers et bercée par les cigales!! Que dire de plus! Merci à Giuglio pour son accueil, sa gentillesse et sa disponibilité. Juste que la côte pour arrivée à la maison est un peu longue. Mais le cadre reste idéal pour des vacances relaxantes." "Bellissimo posto, vicino sia al mare che alla montagna (e che mare, e che montagna!) La casa era immacolata, il frigorifero pieno, il proprietario di una gentilezza e simpatia uniche. Siamo stati molto felici a Cellino, con la sagra dei cingoli una sera, l'escursione al Gran Sasso un giorno (consiglio vivamente la seggiovia che parte da Prati di Tivo), e il mare pulitissimo di Pineto. La frutta e la verdura del posto erano di una bontà uniche. Insomma, abbiamo scoperto l'Abruzzo a Cellino, e se è tutto così, dovremo farvi un pellegrinaggio annuale." "Une très agréable maison idéalement située entre montagnes, campagne et mer. Son accès, par une petite route grimpante au milieu des oliviers est un régal pour les yeux et dépaysant après une bonne baignade à Roseto ou Pineto. L'accueil du propriétaire, Giulio, est remarquable, vraiment aux petits soins pour ses locataires. La maison est très bien équipée, le jardin agréable et les figues au mois d'août bien mûres ! Toute la famille est charmante. Les Abruzzes est une très jolie région, avec un magnifique soleil. Rome, ville magique, à 1h40 en voiture, c'est idéal. Nous avons passé 2 merveilleuses semaines en famille. Nous vous recommandons ce logement, super, comme le sourire et la gentillesse de Giulio. Grazie mille di tutti Giulio, a presto ! Eric, Valérie, Alexis et Hugo"